Happy Monday! This year I’m partnering with Home Depot working with them on their DIH ( Do it Herself) Workshop… which I’m SO excited about!!! Well friends… this is the week! 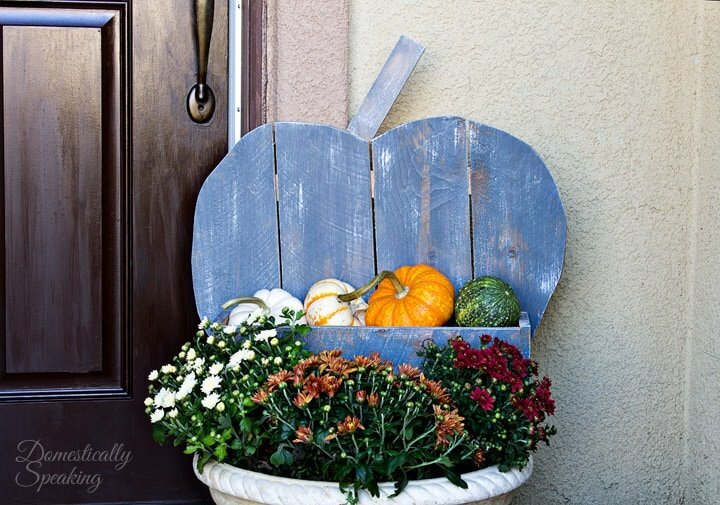 This Thursday is this month’s DIH Workshop and your local Home Depot will be showing you how to make your own Rustic Pumpkin Stand... quite possibly one of the cutest fall diy projects! Here’s my version of this fun project! 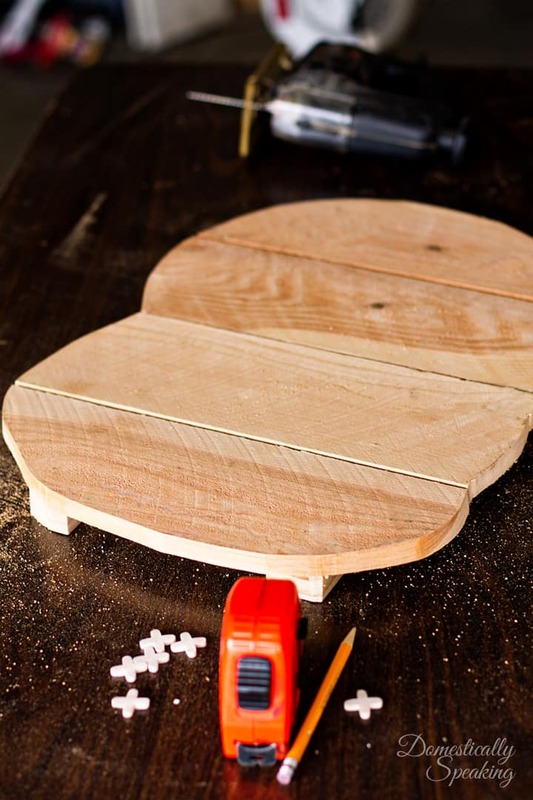 Lay the four 18″ pieces of the Cedar side-by-side leaving a slight gap between each board. I used tile spacers to keep the same gap. 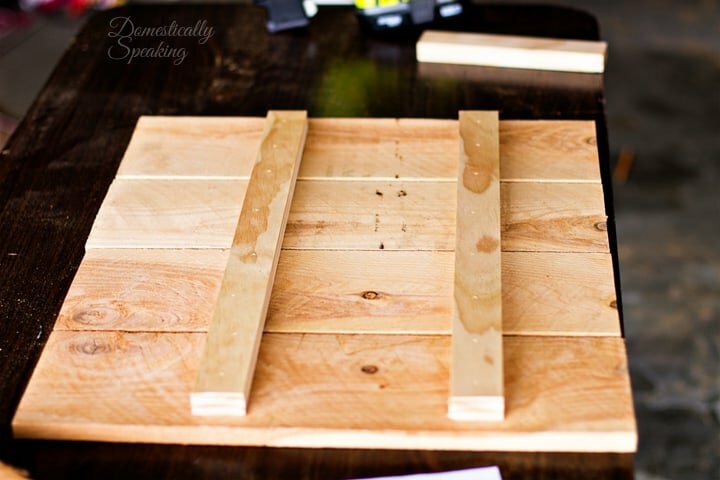 Place the two 20″ pieces on top and use wood glue and the nailer to attach the pieces. Flip over the piece and trace out a pumpkin shape (be careful to note where the attachment boards are). Use the jigsaw to cut out your pumpkin. Attach the 8″ stem to the back of the pumpkin with wood glue and the nailer. Create a box using the remainder of the cedar pieces. Use wood glue and the nailer to hold together. I decided to stain and paint at this point before attaching the box to the front of the pumpkin. I used Weathered Gray by Varathane. I put a very light coat on as I wanted some of the wood to still be peaking through. Once it was dry, I dried brushed with some white paint. 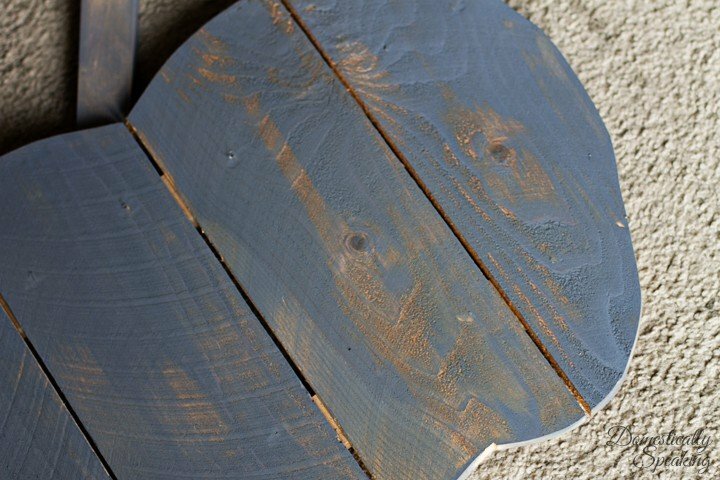 I love creating that worn look! Once it was dry I attached the box to the front of the pumpkin using wood glue and the nailer again. Such a cute Rustic Pumpkin Stand!!! I happened to find some pumpkins and mums last week… I might have done a little dance! So I piled that little box full of some cute pumpkins and gourds. candy for the kiddos on Halloween… so many options! So this Thursday, September 17th you can learn to make one too at this month’s DIH (Do it Herself) Workshop! If you never have gone you need to! They are so much fun… it’s a GNO (Girls Night Out) with power tools! All skill levels are welcome. The Home Depot offers Workshops at all of their locations for do-it-yourselfers of all ages and experience levels. Along with the DIH workshop they offer a DIY (Do It Yourself) and Kid Workshops. 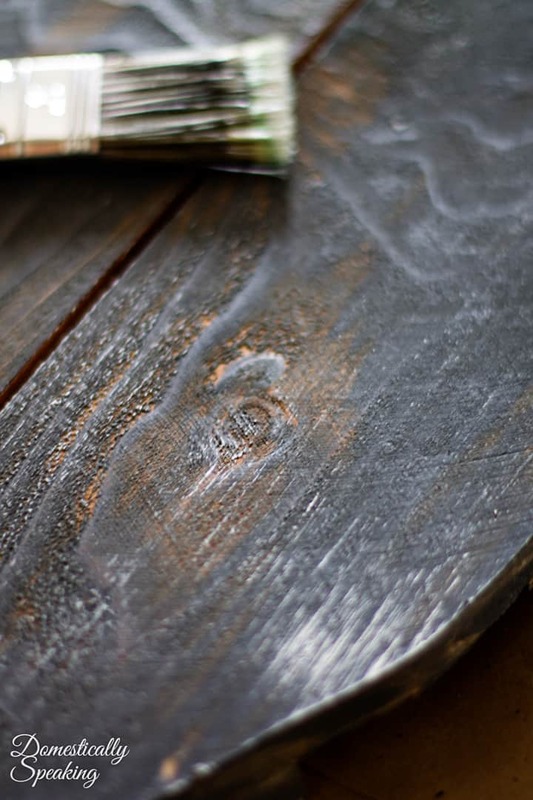 Customers can learn how to build décor projects, how to make easy home repairs and how to operate tools through demonstrations and step-by-step instructions. Each of their workshops are designed to provide a mix of association-led instruction, demonstration and some hands-on learning. Materials can be purchased (they’ll have them available at the workshop) so you can make your own. 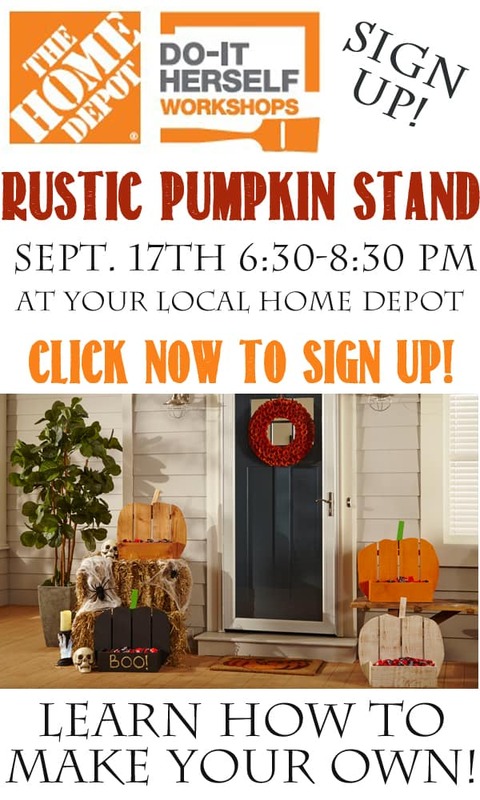 So make sure you sign up… Click HERE to register at your local Home Depot for this CUTE Rustic Pumpkin Stand!!! AND if you’re in the Phoenix area… I’ll be at the Thunderbird store #468 this Thursday… hope to see some of you there! 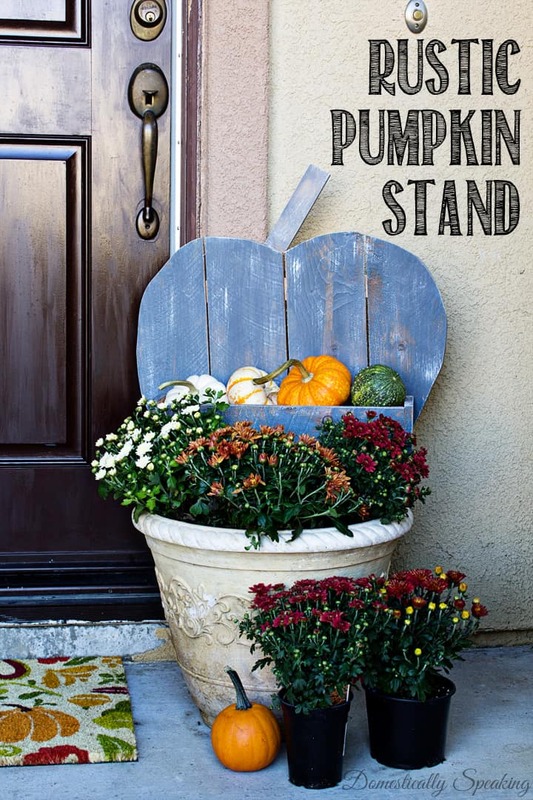 Make sure to check out all these amazing bloggers and their take of this cute Rustic Pumpkin Stand! 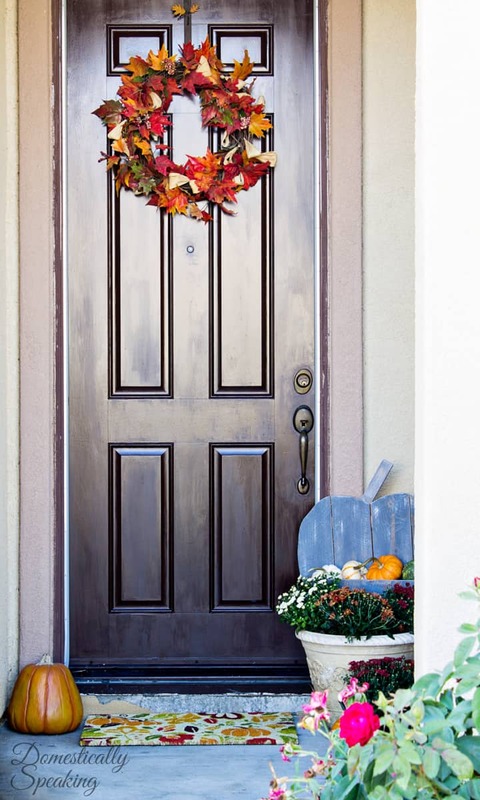 Love it filled with pumpkin and gourds – so pretty on your porch Maryann! I love the color of your pumpkin stand, it looks great! Also love how you filled it with cute little pumpkins and surrounded it with mums, that says fall perfectly! What a great idea! 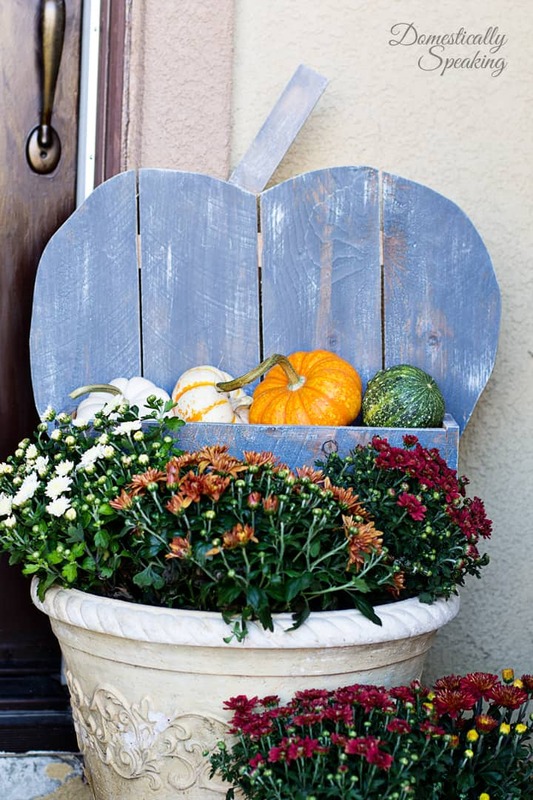 I love the layering with the planter and the mums – perfect for fall! Love it! It looks just perfect on your porch! I think this is the perfect type of decoration to have outside as you’ve done here. It looks great with your mums! this is super cute, yours turned out great!!! So stinking cute! I wonder if kids are allowed?! My boys would love to make something like this. Hi Jeanine! I’ve been to a few where there were older kids. (10+) I’d call your local Home Depot to double check though. What a gorgeous Pumpkin Stand!!! So much fun to make and be a part of this team! !